If you are looking for a classic 3-reel slots machine to celebrate a big slots win with, look no further than the Cracker Jack slots. Click here to play! These slots are all about celebration, making them perfect for when you want to give yourself a pat on the back for a successful night of online slots play. 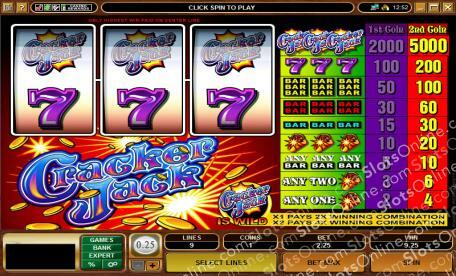 As with most online 3-reel slots at Microgaming casinos, the Cracker Jack slots feature BAR, double BAR, and triple BAR symbols, with wins even paid on combinations of different BAR symbols. Lucky 7 symbols are also featured as part of the standard classic slots layout, as is the game logo for the wild symbol. The Cracker Jack slots do have a bit of a twist, however, as they use Dynamite symbols to fill in for the usual single symbol payoff that normally applies to cherries in classic slots. This makes them just a little bit different to the other 3-reel slots. Everyone likes to have a party when they have a big win, so why not celebrate the smaller ones too with a roll of the Cracker Jack slots. The Cracker Jack Logo symbol is wild and substitutes for any other symbol. It also doubles the prize when 1 wild is substituting, and quadruples the prize when 2 wilds are substituting.